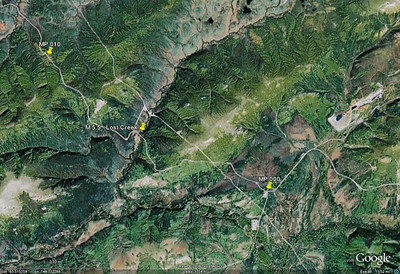 Photos depicting scenes anywhere near and north of MP 0 to just south of MP10. NOTE: Most of these photos were uploaded at full resolution. To see maximum detail, do a mouseover of the photo, and when the menu choices appear along the right hand side, choose "ORIGINAL". Google Earth view of this stretch of road. The pipeline can be seen to take a more direct route across the terrain. 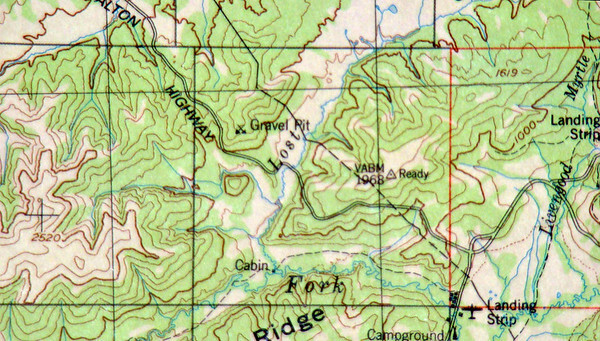 Topo map view, from near Livengood to north of MP12. Note the old route, that now crosses the present highway at MP 0. 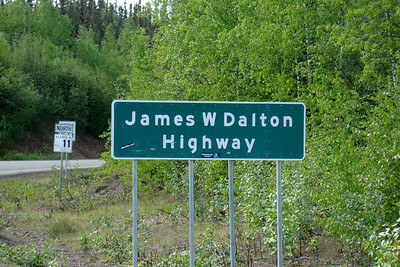 This is where most riders pull off to take their photos of the sign marking the beginning of the Dalton Highway. 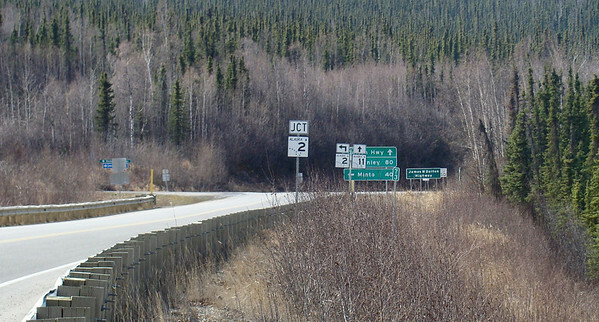 Approaching the beginning of the Dalton Hwy, the plethora of signage can easily translate into information overload. 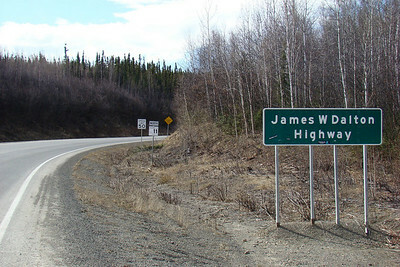 The Elliott Hwy. 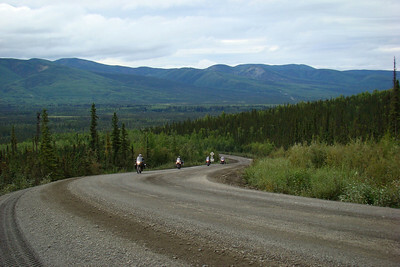 continues to the left toward Manley Hot Springs as AK-2, and the Dalton Hwy. begins here designated AK-11, as one continues northward on the pavement, which quickly ends. 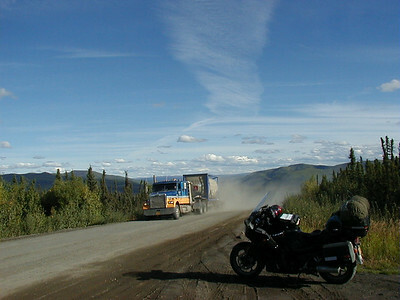 Mile 0, and the beginning of the Dalton Highway - the Haul Road. N65.48941, W148.65469, Elevation: 624' 82.5 miles from the gas pumps at the Fred Meyer store on Airport Way. 8/8/08 10:35AM: Almost immediately upon joining the Dalton Hwy, a climb that can offer a challenge to bikes after a day of rain. This day it was dry and nicely graded, just a little loose gravel away from the tire tracks. 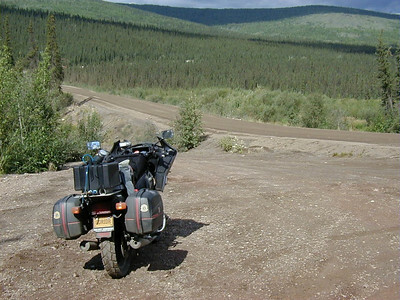 7/29/04 2:10 PM - At Lost Creek, just a few miles after the beginning of the Haul Road, I stop to double-check the bike, making sure everything is fastened securely in anticipation of the bumps and washboard to come. 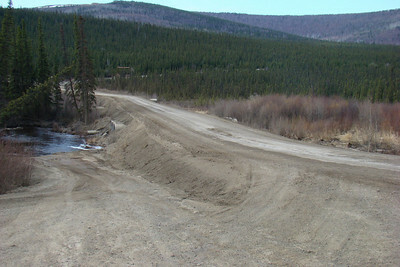 5/11/08 4:16 PM - Lost Creek is the first creek crossing on the Haul Road, about 5.5 miles from the start. 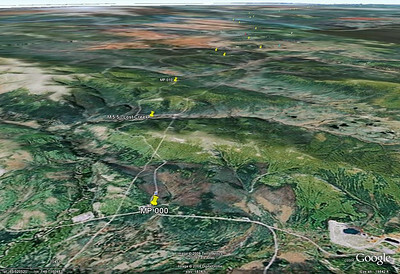 Another Google Earth view, this one giving a hint of the irregular topography.